Although Scripture does not directly talk about healthcare, there are definitely many biblical principles that we can follow regarding this topic. Health is important to the Lord and it is essential for a healthy walk with Christ. It is always wise to make plans for the future. We should be doing everything necessary to remain in good health. When we are not preparing ourselves, it may seem easier now, but we may be hurting ourselves in the long run. When you are negligent of your body it may come back to haunt you as you get older. We should be getting a good night’s sleep, regular exercise, we should be eating healthy, refraining from things and activities that may harm our bodies, etc. 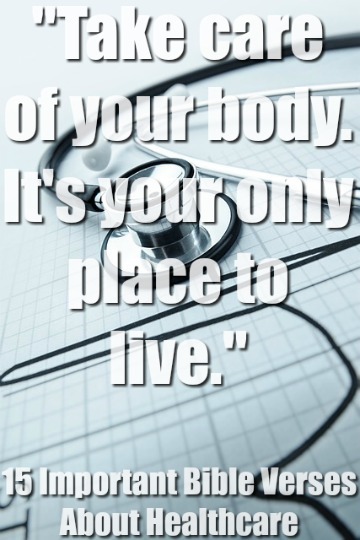 Scripture tells us to take care of our bodies. Taking care of the body that the Lord has given you is another form of honoring the Lord. It is revealing a heart that is grateful for what God has given them. You want to be prepared physically to do whatever God calls you to do. I believe that all families should be covered with some type of healthcare. In John 16:33 Jesus said, “I have told you these things, so that in me you may have peace. In this world you will have trouble. But take heart! I have overcome the world.” Jesus made it abundantly clear that we would go through trials. Healthcare is a form of preparing yourself and your family. Medical costs are skyrocketing! You never want to have to pay for a medical emergency out of pocket. Many people think that it is showing a lack of faith. No! Above everything else we trust in the Lord. However, it is us being wise and caring for our family. If traditional health insurance costs too much, then you can look into more affordable options. There are many Christian insurance alternatives that you can take advantage of such as Medi-Share. Medical treatment in the Bible. God has blessed us with medical resources and we should take advantage of them.